Anyone remember going to see the Rocky Horror Picture Show back in the day? Did you go at midnight, dress up, and throw things at the screen? Anyone who went, and even those who didn’t, will remember the iconic lips in the beginning of the movie. That’s what this cheeky jacket reminds me of! I’ve always been a rocker chic/boho gypsy girl from way back in the day. With my husband recently joining a local band, we’ve been getting out and about into the Bay Area music scene and it’s sure been a blast! And of course one of my fav parts is getting a chance to dress up for the shows! I’ve had my eye on this Shein jacket for awhile, but just get couldn’t imagine myself wearing it anywhere really. Certainly not to teach school (though I’m sure my kids would get a kick out of it), though maybe going out and about on the weekend. Now of course I have the perfect excuse to wear it! And knowing me, now that I have it and love it, I’ll probably end up wearing it more places than I think I will. And FYI: these Mercer Edit Full Monty studded boots are finally back in stock! This outfit totally makes me happy. And isn’t that what fashion is all about, Dolls? Shein gave me this jacket to review. All opinions are my own as always. Well, thank you Dawn Lucy. 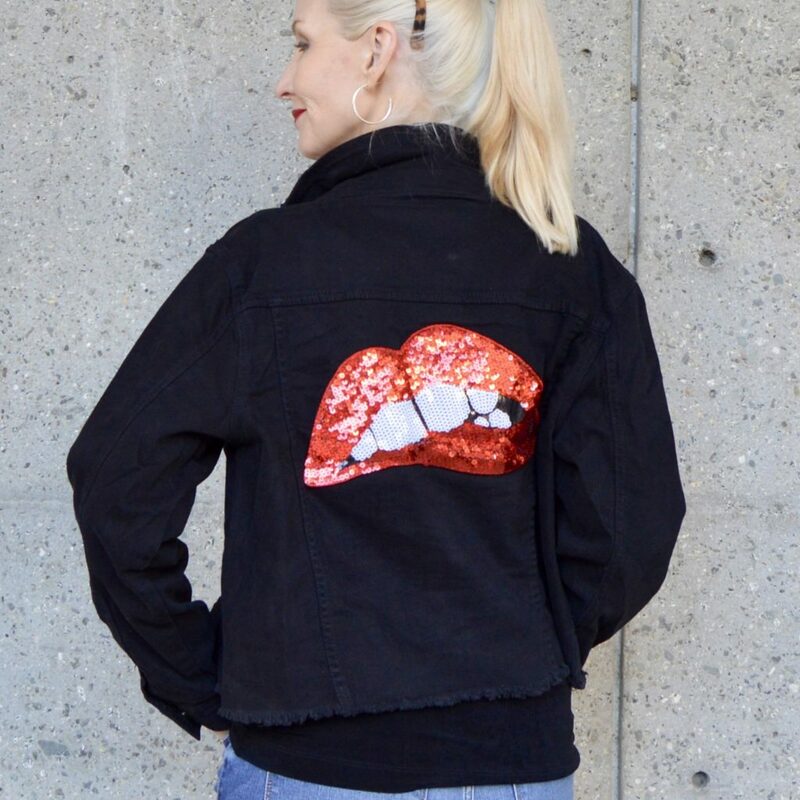 I’m not singing, “Let’s do the time warp again!” 😉 This jacket definitely screams rocky horror. Or Rolling Stones and I love it. Cool as ever!! I think this is the funnest – coolest – outfit that I’ve ever seen !!! Love it! Gotta tell ya though .. I saw Rocky Horror as a tween and I was horrified. As an adult, I still don’t like the movie .. it is what it is, but not for me. Oh yes, back into time! BTW, It also reminds me of The Stones which I am going to see in October!!!! But I love your outfit! 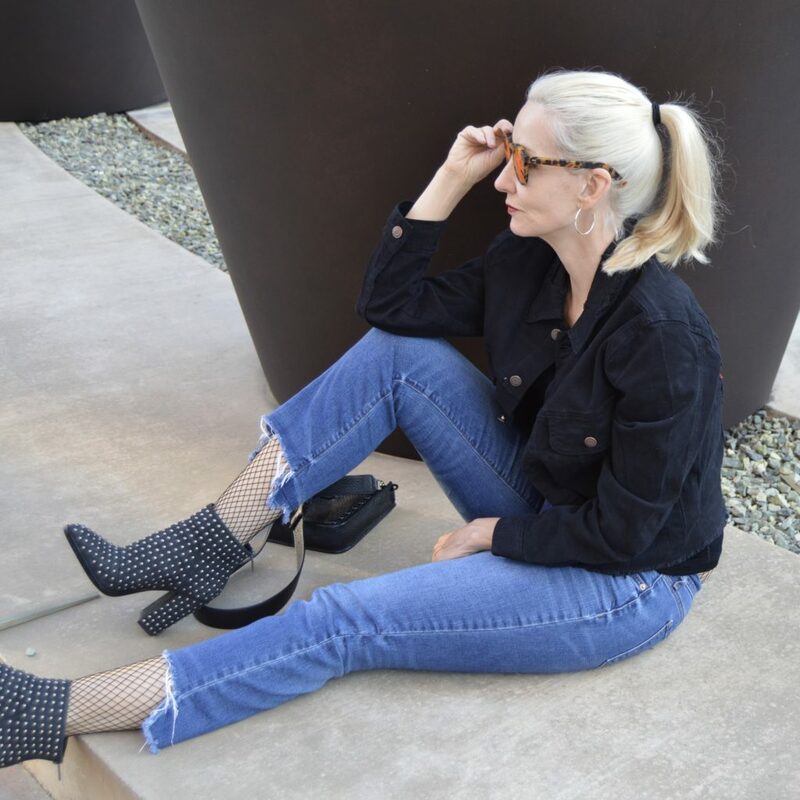 The jeans, the shoes, the fishnet hosiery! Fantastic! Oh I would love to see the Stones! Yay you! I am seeing Guns & Roses in November! This is amazing! Wonderful., fun! Want that jacket and boots in my closet! Omg, this is so hilarious. I am in love with your denim jacket. The whole outfit really fits you well. So many cute poses. Such a fun look! Love that jacket! Thanks, Candice! When I first saw them, I couldn’t stop thinking about them until I went back to get them! Rock and Roll Dawn! THose are some cool boots! That jacket is fantastic. I’m not much of a fan of graphics in the front, lest they bring attention to my bustline so I adore the idea of one on the back of a jacket. In fact, I have a denim jacket with skull and crossbones in rhinestones on the back that surely need to be wearing come this October. Thank you for joining up with my Fine-Whatever link up. Dresses made of Sequin Fabrics add sparkle to any outfit.